Nicole Berlin is a graduate student in Classical Art and Archaeology. She received her BA in Classics and Anthropology from Northwestern University and has had a wide variety of experiences in the art world, from the excavation of a Roman villa at Chiusi to working on Egyptian archaeology documentaries in Rome. Nicole is a graduate intern at the JHUAM and has a particular interest in Roman wall painting. This peacock blue glass tray has a flat bottom, shallow sides, and “ear” shaped handles. Only half of it is preserved. The vessel was cast and the intricate handles cut with a lathe. 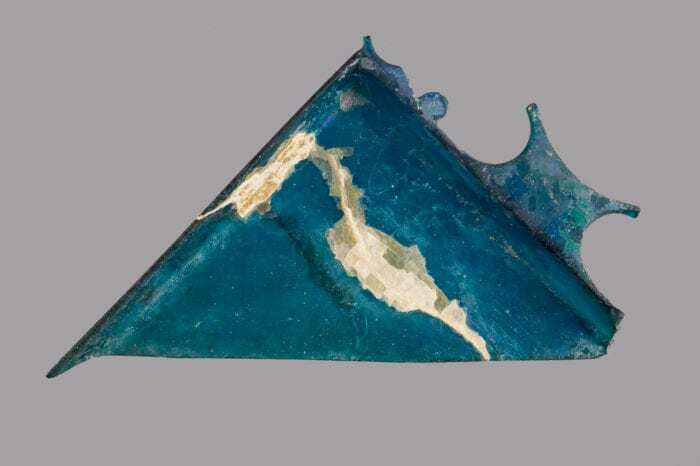 It belongs to a very specific group of brilliantly colored fine ware that was produced in Italy and the Northwestern provinces in the 2nd quarter of the first century CE. Four specific colors can be associated with this class of vessels, including emerald green, cobalt blue, aquamarine and “peacock” blue. Contemporaneous ceramic and metal forms likely influenced the form of this vessel. A number of similar trays have been found at both Pompeii and Herculaneum. Grose suggests that this is a testament to their high value since production seems to have stopped by 60 CE (Grose 1991, “Early Imperial Roman Cast Glass,” 9). By the Flavian era, this demand for bright color gave way to colorless vessels that dominated glass production until the fall of the Roman Empire.